Thrissur to Bangalore.. in 2131TRCBNG yet again! The 2131TRCBNG Airavat Club Class schedule has off-late been a service of choice for me. The service is quite consistent - and being a service starting from Thrissur has been a plus point for me. Its been a routine for me to keep a ticket book for this for Sundays following the Third saturday of every month. February was no different. I normally book the same seat as well - #17. It was around 7pm on my watch - I was on my way from my home to Kodungallur in a rickety private bus. It creaked its way to Kodungallur municipal bus station, dropping me there around 1915hrs. 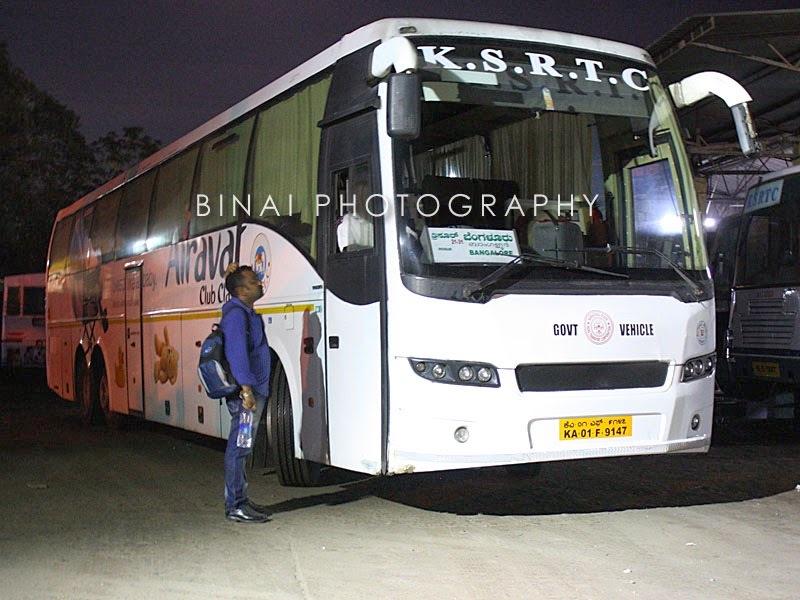 There was no KSRTC bus to Thrissur there - but I decided to wait. After some moments of waiting, I saw RT285 of Thrissur came in and reversed into the platform. 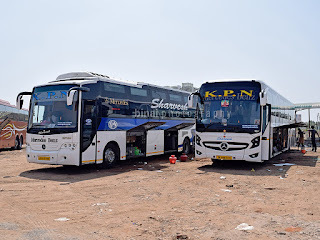 For some reason, Kodungallur municipal council feels that KSRTC and Private buses should not be parked in the same area - this meant that KSRTC buses get poor loads and often are not noticed by passengers (except those in the know). The bus started off at 1930 and reached Thrissur around 2045hrs (took quite longer than usual) - on the way the driver was threatened by a private bus crew against overtaking them. I felt sad for these drivers. As usual the driver stopped a little away from the KSRTC bus station and then headed off for refueling, at Sakthan Nagar. I walked into the bus station at around 2050hrs. Thrissur bus station is a mess on Sundays - the bus station is too cramped and there would hardly be space to stand. 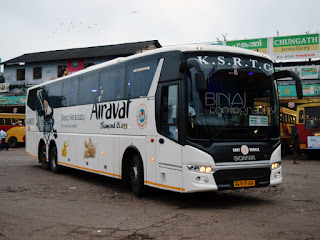 At around 2100hrs, my bus was brought out of the parking, but the security guards at the bus station stopped the driver from taking the bus to the boarding area. In the meantime, I got the SMS with bus number and crew's contact number. The bus remained away from the boarding area until around 2110hrs. Then the driver brought it inside, but this irked the security staff - they picked up a quarrel with the crew. The security guys argued that KaSRTC is permitted to park at the platform only 15 minutes before departure time. As the quarrel continued, the clock ticked past 2115hrs - the driver now took the bus to an empty platform that he saw. The security guys were still irked, and they foul-mouthed the ACC crew. The bus - KA-01-F-9147, bring brought in for departure. In the meantime, boarding commenced. The conductor swiftly checked tickets and verified identity proofs. I got in an occupied my seat quickly. Unlike on normal days, the crowd was light that day. The bus was only half full - I was shocked. The bus started off at 2139hrs - 8 minutes late. The conductor had picked up some unreserved passengers as well, and some tickets to Palakkad. The conductor now explained their sorry tale - it seems the fight with the security guys are regular incidence now. They don't let the buses come to the platform early, and they abuse the crew when the come a bit early. He was saying that they have collection targets and the 15 minute time allotted is too less for a service like theirs. While I did sympathise a bit with the crew, I felt they could instead use the idle parking area to park the bus and call for passengers. The driver did not seem in a hurry at all - he took his sweet time to pick pace. 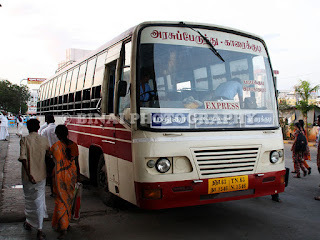 I dozed off for a while in between, and woke up just as they bus turned off the highway, to reach Palakkad bus station. Quite unusually, the bus entered the bus station to pick-up passengers (2302hrs). The bus filled up here - almost 25 passengers got in here. We started off at 2311hrs from Palakkad. I slept off after Palakkad - quite a nice sleep then. I should agree to this - the drivers are really sleep friendly. They don't honk, brake hard or cut rashly - they do let passengers sleep like a baby. I slept continuously, until we reached Attibele - it was 0553 then. We were late. The bus stopped at Electronic City - a whole lot of passengers got off here (0610hrs). We crawled for some more time, and I got off at Bommanahalli exactly at 0621hrs. We were quite late by regular standards, and I was a bit upset by the delay as well. We took almost 9 hrs (8h42m) to run 454kms without any breaks! Thats high for the distance, for a premium bus. End Remarks: The bus was KA-01-F-9147. The bus had about 5.68 lakh kms on the odo. She had been running to Ernakulam earlier - and this bus had a full sized emergency exit. Maintenance was quite average - it squeaked and rattled quite a bit. The interiors were good though. Driving was good as usual - very sleep friendly. Like every time, this time too, I repeat that they need to tighten the timings of their premium services. They should avoid wasting time unwantedly. Otherwise, its surely a great option - very pocket friendly as well. Airavat to Thrissur, via Gudalur, yet again.